In the following days, through Facebook, Rodrigo Serrano, a communications major at the Iberoamerican University, called on his fellow students to post their names and IDs to prove that they weren’t just lackeys hired to protest Peña Nieto, but students with their own convictions and ideas. A video soon surfaced in which 131 students from the Iberoamerican University identified themselves, showing their faces and presenting their school IDs. The video went viral. The hashtag #131esudiantesdelaibero (“#131studentsfromtheIberoamerican”) became a trending topic on Twitter, receiving almost 500,000 hits that same morning. Others outside the university, and all across the country, quickly joined. If these Iberoamerican students were the 131, their supporters declared themselves the 132nd. The hashtag #Yosoy132 (“#Iam132”) danced across the cyberwaves and remained a Trending Topic for a week. But there was little coverage in the mainstream media. The few reports from Mexico’s largest television channels usually attempted to link them to Mexico’s Party of the Democratic Revolution, which was opposing Peña Nieto in the election. In response, #Yosoy132 activists planned a rally for Wednesday, May 23, to lodge their complaints against the television channels TV Azteca and Televisa, which had meticulously built Peña Nieto’s image over the last six years, providing daily prime coverage on him and his 2010 marriage to Televisa soap opera star Angélica Rivera. The demonstration was to be held at Mexico City’s new 340-foot-tall Estela de Luz monument—a stark symbol of Mexico’s corrupt political system. The outgoing administration of President Felipe Calderón had spent over $75 million to build the quartz-plated tower, and its construction was marred by problems, delays, and inflated prices.2 Organizers anticipated a couple hundred people. Protesters arrived wearing costumes of cardboard television sets, and the crowd soon swelled into the thousands. Participants spilled out from the plaza onto Paseo de la Reforma and all the way to the Ángel de la Independencia. They had barely begun and already they had outgrown the street. “To the Zócalo!” someone yelled, and the crowd headed toward Mexico City’s iconic main square. But on the way the marchers detoured to deliver several complaints to the front door of Televisa. As they marched, people greeted them from balconies and car windows, fists of solidarity in the air. “El pueblo consciente se une al contingente!” they responded passionately (“The conscious people unite the contingent!”). The protesters arrived at Televisa, posted their demands on banners above the walls, and steered toward the Zócalo. The sun set over the heads of the young #Yosoy132 activists as they swarmed into the square. They had taken the city. Many celebrated with drums into the night. Others sat on the esplanade and deliberated in raised voices. They didn’t know it, but this was the first assembly. 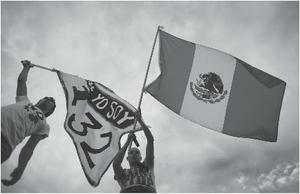 This was the beginning of the #Yosoy132 movement, which also came to be known as the Mexican Spring. Over the next week, students prepared to hold the first citizen-organized Internet broadcast of the presidential debate in the history of the country. For days they ran tests to ensure that thousands of people could watch the debate online, but Mexico’s major television networks doubted the student’s technical capabilities. On June 20, the day of the debates, the networks insisted that they be aired directly from their stations. Their arguments were valid: With a fierce storm raging outside, the unprecedented support for the online debate could be all for naught if the wireless connection were to fail. The five students in charge of the organization, all of them in their twenties, addressed the media that waited eagerly for the event. In a makeshift press conference at the Human Rights Commission in Mexico City—where the debates were set to be held—the students sat before dozens of cameras and reiterated their decision to broadcast the debate only through the Internet. “We were born on the Internet, in social networks. It’s pretty much what we have for breakfast, what we eat. They could trust us to deliver,” said Ana Rolón, one of the organizers and a student at the Iberoamerican University. The reporters and editors from Milenio and Televisa covering the debate casually dismissed the student’s intentions, but the decision represented the central message of the #Yosoy132 Movement: the democratization of the media. For the students, airing the debate through the Internet was a show of power, a sign that they didn’t belong to the monopolies. The students demanded respect. They would show that they were capable of standing up and speaking with the authority of individuals who believe the state is at the service of the people. “If I send a Tweet to a government official, I expect them to respond within 24 hours,” explains Serrano. Like most of the students involved in #Yosoy132, he is around 20, was born in the midst of the worst economic crisis in the country’s history, and grew up with the arrival of “democratic life” to Mexico, with the election of President Vicente Fox in 2000, after 71 years of PRI rule. Serrano’s attitude toward the government reflects how this generation has come to understand its relationship to authority: a personal and direct dialogue, in which citizens have the right to an opinion and elected officials have an obligation to respond to the people they represent. That’s why they took to the social networks to stand up to those who denied that they can think for themselves, and took to the streets to denounce the major media networks’ attempt to impose a presidential candidate on them from above. Serrano even wonders if it would have occurred without Facebook, Twitter, and YouTube. He is also clear that they didn’t “build” a movement, but that it’s a manifestation of the way they see the world—through an open window of social networks, not through the black box called television. Social networks provide a far-reaching and level playing field that maintains a plurality and equality to which you can immediately react to information and expand upon it. They also open dialogue—between students and the public and private universities; between the children of businessmen and politicians who have benefited from neoliberalism and the children of teachers, workers, and the unemployed victims of the elite. They create a dialogue between those who believe in the state and those who work to erase it. This is a form of political activism. The #Yosoy132 activists communicate through quick tweets and lengthy meetings, and if the former is an effective organizing tool, the latter is where people get to know each other. The masses emerge from the social networks and flood into the streets to show the strength behind the trending topic, #Yosoy132. 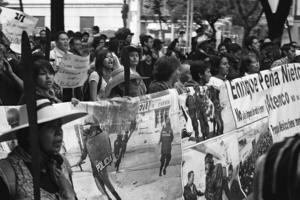 What began May 23 at the Estela de Luz is an example of the movement’s grassroots nature. Each step has appeared to skirt the edge of some unknown abyss as students blindly chart an unfamiliar path of resistance. The horizon of the #Yosoy132 movement has been plagued by the question, “Will it survive?” Pundits and adult sabelotodos (“know-it-alls”) doubted that it would live past the July 1 presidential elections and advised the “kids” on how to extend its indiscernible lifespan. Many believed that a PRI victory would mean the end of the movement, due to a division between those who would dispute and those who would recognize the electoral results. This proved false when, on July 1 Peña Nieto defeated his leftist opponent, Andrés Manuel López Obrador. Rumors of fraud were widespread. Votes, people said, had been bought, PRI campaign expenditures were over legal limits, and election survey data had been manipulated to favor the PRI. Within 24 hours, protesters were in the streets, including many #Yosoy132 activists, who had organized observer teams to oversee the polling places, gathering more than a thousand documented cases of irregularities during the elections—including vote buying and the altering of results at the voting booths. Two weeks later, some 300 left organizations, including #Yosoy132, unions, campesinos, and indigenous communities, met in San Salvador Atenco to hold what they called the National Convention Against the Imposition. They agreed to mobilize across the country through occupations, sit-ins, boycotts, pickets, and strikes and to block the inauguration of Peña Nieto in December. #Yosoy132 activists also hope to increase government transparency by transforming their movement into a watchdog and, above all, to continue demanding the democratization of the media. Luis Gómez is a Mexican freelance journalist who has been following the #Yosoy132 movement from the beginning. 1. Sinembargo, “¿Investiga y ‘ficha’ el PRI a alumnos? VIDEO: Peña Nieto recibe ‘expediente’ de una estudiante ‘pro AMLO’,” Tiempo Real (Mexico City), May 18, 2012, available at sinembargo.mx. 2. Los Angeles Times, “Mexico Inaugurates Monument 16 Months Late and at Triple the Budget,” January 9, 2012, available at latimesblogs.latimes.com.